1982 Click on the month you wish to view. 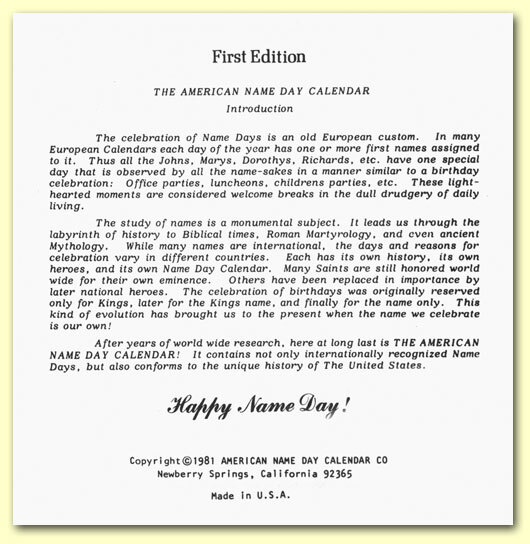 ..The American Name Day Calendar of First Names - 1982!" And speaking of the very first, "George"
the very first President of the United States. What can be more fitting than that? Below is a copy of the original "Introduction" of the 1982 calendar. or click on the small "thumbnails" below for a larger view. 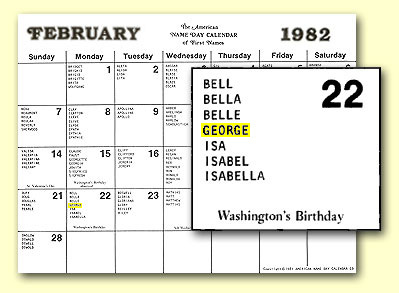 For the copyright and other legal reasons we show the exact copies of the pages of the 1982 calendar sent to the U.S. Copyright Office for mandatory deposit as required by law. To view copies of the original 1982 calendar index pages, click on the lines below. 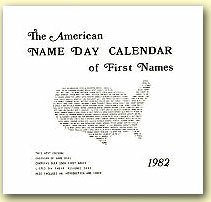 As you may already know, for names by gender in the 1982 calendar, we used "Feminine" and "Masculine", instead of "Female" and "Male". The ad, introducing this quite unusual calendar here in the United States, appeared in the Los Angeles Times HOME magazine on October 25, 1981. Part of the ad can be seen on the left. We have received a countless number of questions over the years about this celebration, and since we are now online, (also "at long last" - as we say in the 1982 introduction about the nameday calendar itself) we have put together a separate, hopefully informative enough, "Questions & Answers" page. For that, please click on "F.A.Q. ".